Hokkaidō (北海道) is the northernmost and the second largest of Japan’s four main islands. It is separated from Honshū to the south by the Tsugaru Straits (津軽海峡 Tsugaru Kaikyō) and bounded by the Sea of Japan on the west, the Sea of Okhotsk on the northeast, and the Pacific Ocean on the south and the east. Several mountain ranges cross Hokkaidō, and those belonging to the Ezo Mountains (蝦夷山) run from north to south across the centre of the island, separated into two strands by a series of basin areas. The Ishikari Plain (石狩平野) lies to the west of these mountains; to the southwest of the plain is a long peninsula, which is the area closest to Honshū and the first part of the island to be inhabited by the Japanese. The climate is unlike the rest of Japan, being notably colder and drier. The prehistoric culture of Hokkaidō seems to have shared many of the characteristics of the early civilisation of Honshū, except for the lack of the Yayoi (弥生) Culture. Hokkaidō, or Ezo (蝦夷), as it was known, was inhabited by the indigenous Ainu and not included in Japan proper. In the Edo period (1600-1868) the Matsumae domain (松前氏 Matsumae-shi) was established in the extreme southwestern corner of the island. After the Meiji Restoration of 1868, the new government placed great emphasis on Hokkaidō’s economic development, setting up the Hokkaidō Development Commission (開拓使 Kaitakushi) and encouraging settlers from other parts of Japan. This resulted in the displacement of the Ainu people who had occupied Hokkaidō and parts of Sakhalin for thousands of years. The name of the island was changed to Hokkaidō (北海道, “Northern Sea Circuit”) in 1869, following a suggestion of geographer and explorer Matsuura Takeshiro (松浦武四郎, 1818-1888). Hokkaidō was divided into three prefectures from 1882 to 1886, which were abolished and the present prefectural form of administration established in 1886. Within Japan’s prefectural system, Hokkaidō alone is called a dō (道, circuit) rather than a ken (県, prefecture); it is, however, the equivalent of a prefecture, divided into nine General Subprefectural Bureaus (総合振興局) and five Subprefectural Bureaus (振興局). Hokkaidō has been a crossroads for Japanese and Russian merchants for some time, and still bears the historical marks of the herring trade, once plied from Otaru: Russian churches and other buildings, Western-style houses, and so forth. 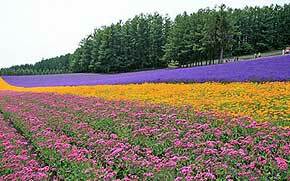 Hokkaidō holds almost twenty-five per cent of Japan’s arable land. The principal crops are rice and grain; vegetable and dairy farming and beer brewing play a significant role, too. Another essential part of Hokkaidō’s economy is fishing, forestry, and mining. Along with tourism, they form the basis for much of the island’s industrial activity, including food processing, woodworking, pulp and paper industries. Hokkaidō epitomises the nature and the great outdoors in Japan. No other part of the country has weather as severe, or as much space as well as dramatic and unspoilt wilderness, which includes active volcanoes, large lakes, and vast virgin forests. Major tourist attractions are Shikotsu-Tōya, Akan, Daisetsuzan, Shiretoko Peninsula and the Reshiri-Rebun-Sarobetsu national parks (see below). The island, the second-largest of those that make up Japan, is roughly square in shape, 70% of which is forested. Although this is nearly 20% of the total area of Japan, just less than five per cent of the Japanese population lives there, giving Hokkaidō one of the lowest population densities in the country. This may in part be attributed to the harsh winters (annual snowfall reaches nearly six meters on the Sea of Japan coast – see below for more details of the weather). Hokkaidō is the coldest part of Japan and sees the most snow of any part of Japan (between four and six meters a year, more than almost any urban area in the world). Temperatures are below zero degrees centigrade for most of the long winter, and regularly exceed ten degrees below freezing. This combination makes for some of the best and the most reliable snow in Japan, and Hokkaidō is a popular skiing, snowboarding and cross-country skiing destination. The less-severe typhoon season in Hokkaidō shows through in better sunshine during the summer, but the heavy snow in the winter means grey skies for that time of year. Some claim that Hokkaidō does not have a typhoon season; get caught in one, and you’ll realise the fallacy of that idea. The truth is that typhoons slowly pass further and further north as the year progresses, so fewer tend to make it to Hokkaidō or arrive later in the year. Anyway, be prepared for them as usual. Hokkaidō has a lot to offer at any time of year. In the winter, skiing and snowboarding complement a wealth of onsen (hot spring) and some of the best food and seafood in Japan. Summers are cool and dry, with temperatures in the low twenties centigrade – a welcome break from the heat of the rest of Japan and ideal for hiking, cycling and camping. Spring and autumn are generally brief, but again are good times to see Hokkaidō. 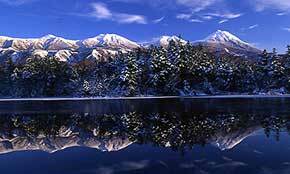 Hokkaidō is best known for food (especially crab and other seafood) and onsen (hot springs), particularly in winter. If you are in Hokkaidō at the beginning of February (usually during the second week of the month) make sure not to miss the Sapporo Snow Festival (さっぽろ雪まつり Sapporo yuki matsuri), a world-famous event that brings teams from around the world to compete building an enormous range and variety of sculptures, some of them truly immense in scale. Never mind if you miss it as there is plenty in Japan’s fifth-largest city to keep you occupied during the rest of the year. Sapporo (札幌市) offers its own version of a staple of the Japanese diet, ramen (like instant noodles, but much better). Sapporo miso-ramen uses miso (a fermented soybean paste) as the soup base instead of pork-stock or soy sauce and is excellent on a cold winter day. Sapporo is a new city, constructed shortly after the Meiji Restoration of 1868 on a grid pattern under the guidance of an American architect. This makes it a little easier to get around, particularly using the Clock Tower constructed in 1868 as your landmark. While here, it is worth seeing the Sapporo Beer Garden, the original home of Sapporo Brewery the oldest brewery in Japan. It is also worth visiting the Old Prefectural Office and nearby Hokkaido University Botanical Garden which also houses an Ainu Museum. If you are here overnight, take the cable car up Mount Moiwa to see the Sapporo lights by night. The tourist information office in the main station has free maps of the city detailing these and other places. Hakodate (函館市) is another common entry point to Hokkaidō, and well worth a couple of days. 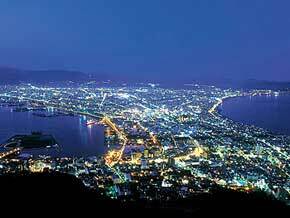 In the west of the city, worth seeing is Hakodate by night from the top of Mount Hakodate. If you have time, the Old British Consulate (with Union Jack, but no longer a consulate) has a tea room (the British kind) and miniature replicas of Commodore Perry’s Black Ships that forced the opening of Japan in the mid-1800s. An old Russian Church attests to other cultural influences. The bay area has several restaurants and seems popular with both locals and tourists. In the area around the station, don’t miss the morning market for the lively bustle and cheap, fresh food. Goryokaku (five-sided fort) was the first western-style fort to be built in Japan and makes a pleasant few hours’ strolls around the gardens. The views of the fort from the nearby Goryokaku tower are worth the entrance fee on a clear day. 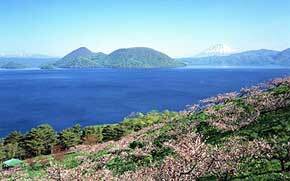 Nearby Lake Onuma is famous for its 126 small and large islands, connected by 18 bridges. Near to Hakodate, Matsumae (松前) boasts well over five thousand cherry trees and a reputation as one of the best places for cherry-blossom viewing in the north of Japan. This is also the old Tokugawa shogunate’s stronghold on Hokkaidō (under the Matsumae family) and has a castle (a replica of the original destroyed in 1949 by fire). Across the bay from Hakodate is Lake Tōya (洞爺湖, Tōya-ko), south of Sapporo. This hot spring resort reminds you of the origins of the onsen – the nearby volcanoes are still active. The last eruption of Mount Utsu (鬱岳, 818 metres) was March 31, 2000, and Shōwa-shinzan (昭和新山 “Showa new mountain”, 402 meters) was formed in 1945, two years after a massive earthquake in the area. Otaru (小樽市), a little to the north of Sapporo, is a canal city well-known for glass work. It is worth a visit, and you can try your hand at glass-blowing (for a fee). 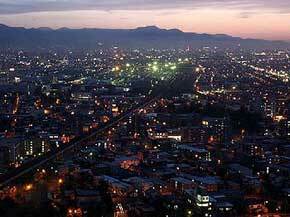 Asahikawa (旭川市) is still further north and is the second city of Hokkaidō. The streets are dotted with sculptures, and the local museum has works by Rodin and other masters. In February the city holds its own Snow Festival, similar to Sapporo’s, and in the summer you can see the Ainu Village Festival, a reminder of the days when this was a large Ainu settlement. Kushiro (釧路市), located on the Pacific coast, is an ideal staging point for the surrounding Kushiro-Shitsugen and Akan National Parks. The area is home to the Japanese crane, and there is lots of camping and hiking to be done in the surrounding hills and marshland. In the centre of Hokkaidō, next to the Daisetsuzan National Park is Furano (富良野市), a small town near some of the best skiing in Hokkaidō. You can also try wine and cheese at the local “wine factory” and “cheese factory”. Perhaps this use of words is indicative of something. In summer, the whole area becomes purple as the lavender crop matures. In the north of the region is Onneyu (温根湯), a famous onsen, for the weary. For onsen in general, some of the most famous locations are Noboribetsu in southwestern Hokkaidō, Mount Maru, also known as Esan Maruyama (恵山丸山) on the Pacific Coast, and Jozankei (定山渓) Valley just outside Sapporo, but there are many others. Hokkaidō is big, and it can take a lot of time to get around it all, so if you are on a tight schedule, you will have to prioritise what you want to see. Most people arrive near Sapporo or in that part of Hokkaidō, so it is a good idea to a short stay in that area. If you are going to be in Hokkaidō for longer, consider trips to Rishiri-Rebun-Sarabetsu National Park in the north(although perhaps not in winter), Daisetsuzan National Park in the centre of the island for excellent hiking and skiing, and Kushiro-Shitsugen and Akan National Parks on the east coast. Shiretoko Hanto National Park in the northeast is also easily accessible from Kushiro and well worth a trip (although perhaps a little severe in the winter). About 14 per cent of the area of Japan (5.3 million hectares) is designated as one of 394 National, Quasi-National of Prefectural parks, and about 13% of that area (715,622 hectares) is in Hokkaidō’s eleven parks National and Quasi-National Parks. A further twelve smaller Prefectural Parks are dotted around the countryside. Recommended if you can find the time are Rishiri-Rebun-Sarobetsu, Daisetsuzan, Kushiro Shitsugen and Akan, although all the parks are well worth a visit. Remember that access may be difficult, if not impossible, during the winter and that you need to remain flexible in your planning. Flights: the most common route to Hokkaidō is to fly to Sapporo (New Chitose) from Tokyo (Haneda Airport) – the busiest route in the world according to the Hokkaidō prefectural government. However, there are plenty of other flights from major and minor airports around Japan to many other locations in Hokkaidō; you can fly to New Chitose (SPK), Wakkanai (WKJ), Memanbetsu(MMB), Asahikawa (AKJ), Nemuro Nakashibetsu (SHB), Kushiro (KUH), Obihiro (OBO), and Hakodate (HKD) from various parts of Japan. International flights to Honolulu, Hong Kong, Seoul, Guam, Saipan and Cairns are also possible from New Chitose, and the rest of the world through either Kansai (KIX) or Tokyo Narita (NRT). IF you are coming from the other end of Japan, then it will almost certainly be cheaper to fly than take the shinkansen (and a lot quicker: flights are about 90 minutes from Tokyo, while the train will take you 17 hours). Train: If you do prefer the train, then you will probably take a shinkansen from Tokyo (Tohoku Shinkansen) to Shin-Aomori Station (3,5 hours), where travellers change to the JR Hakucho limited express to Hakodate (goes through the Seikan Tunnel) and the JR Hokuto limited express to Sapporo. There is also a sleeper train, but this is beyond the budget of most travellers at over30,000 JPY per person one-way. As with flights, you may sometimes get bargains from cheap ticket offices (find them in most major cities near train stations). Hokkaidō Shinkansen (北海道新幹線) is a high-speed rail line currently under construction between Aomori (Honshū) and Hokkaidō through the Seikan Tunnel; the initial Shin-Aomori to Shin-Hakodate section is projected to open in 2015. There are long-term plans to extend the line to Sapporo, with media reports quoting the expected journey time from Tōkyō to Sapporo as 3 hours and 57 minutes. Ferry: the cheapest way to get to Hokkaidō from Tōkyō or other parts of Japan, is by boat. Ferries regularly leave from Ōarai (a little to the north of Tokyo) for Tomakomai(not far from Sapporo), and there are also ferries to and from Muroran to Ōarai, between Hakodate and Aomori, and between Otaru and Iwanai on Hokkaidō and Naoetsu on Honshū. These will take around 20 to 24 hours and cost about 6,000 JPY per person (cheapest seat). Because I am not free to go to Hokkaido during Oct-Mar., please let me know where in Hokkaido I can still feel some snow in mid April. Thanks! Vivien, I suggest your post your question to the travel section of our forum. We have a few members residing in Hokkaido who might be able to help you out.